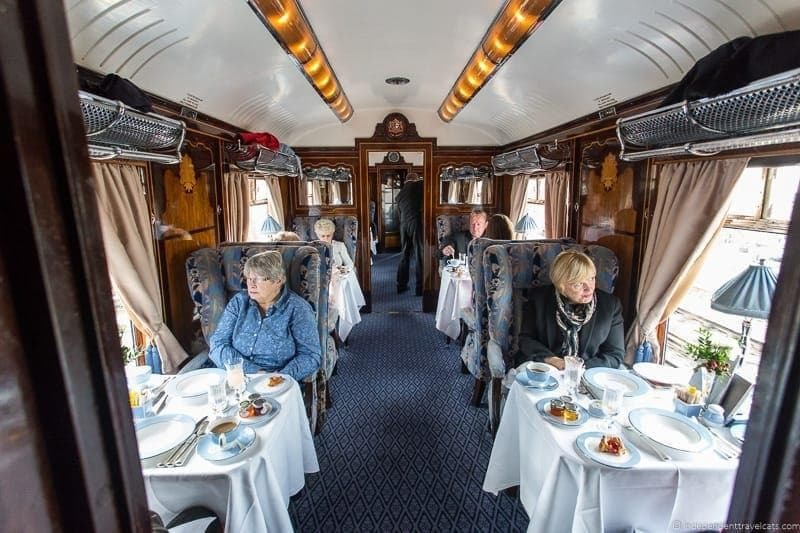 The Belmond British Pullman is the sister train of the Venice Simplon-Orient-Express and is made up of a collection of historic Pullman carriages. Based at Victoria Station in London, the train makes regular luxury day trips and short journeys within England. 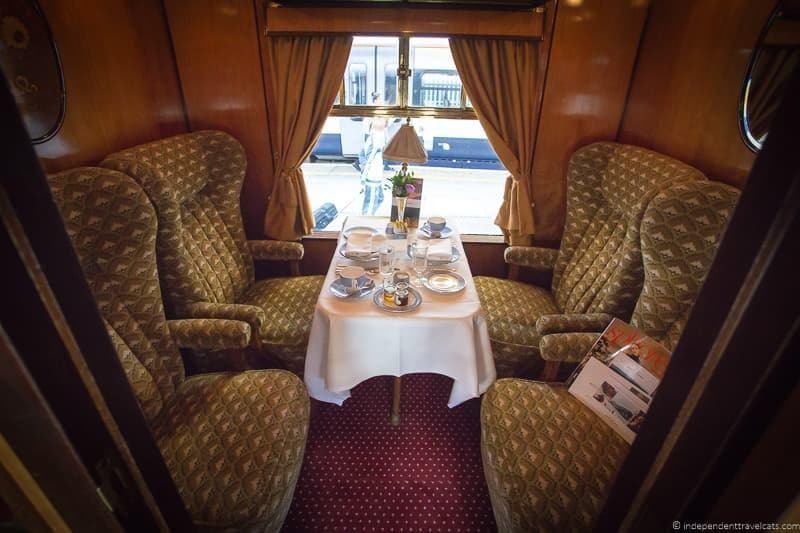 A journey aboard the gleaming umber and cream carriages of the British Pullman is designed to take you back in time to the glamorous age of luxury train travel. 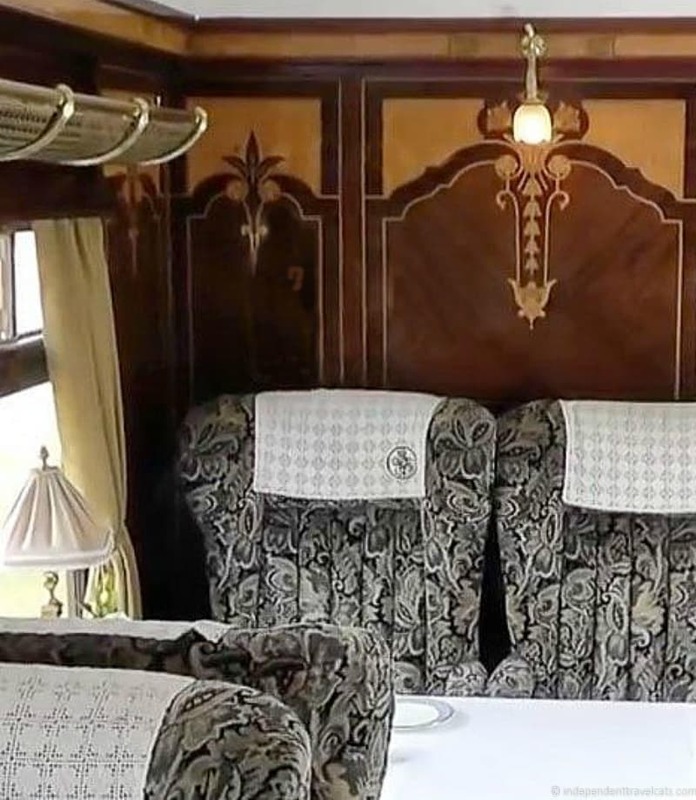 The historical carriages date from the 1920’s to 1950’s and include wonderful art deco marquetry, art nouveau lamps, polished brass fittings, mosaic floors, and plush upholstery. 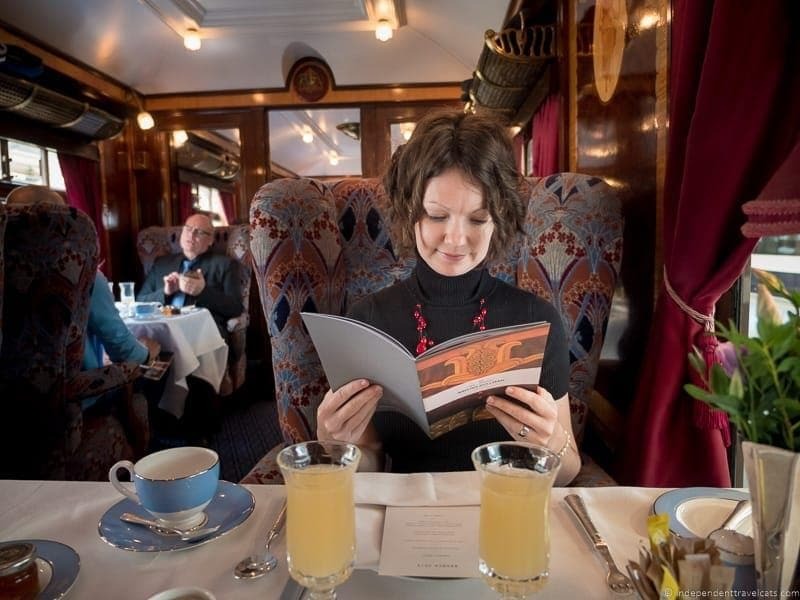 Journeys aboard the train may include brunch, afternoon tea, a murder mystery lunch, and/or musical entertainment. 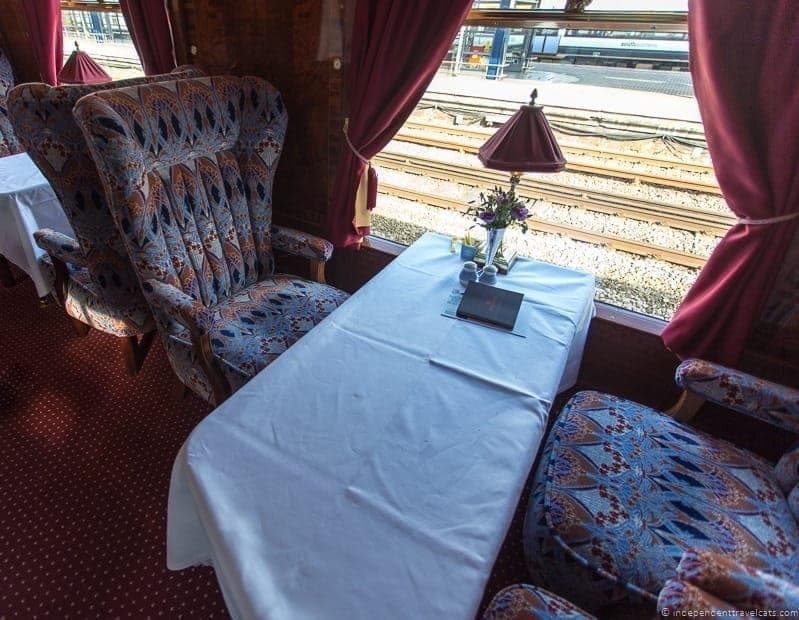 Guests enjoy a meal while they watch the scenery pass by and some journeys include stops at historic cities such as Bath or Canterbury. Although many of the guests are British people celebrating a special day out, it is also a great and unique experience for visitors to London. 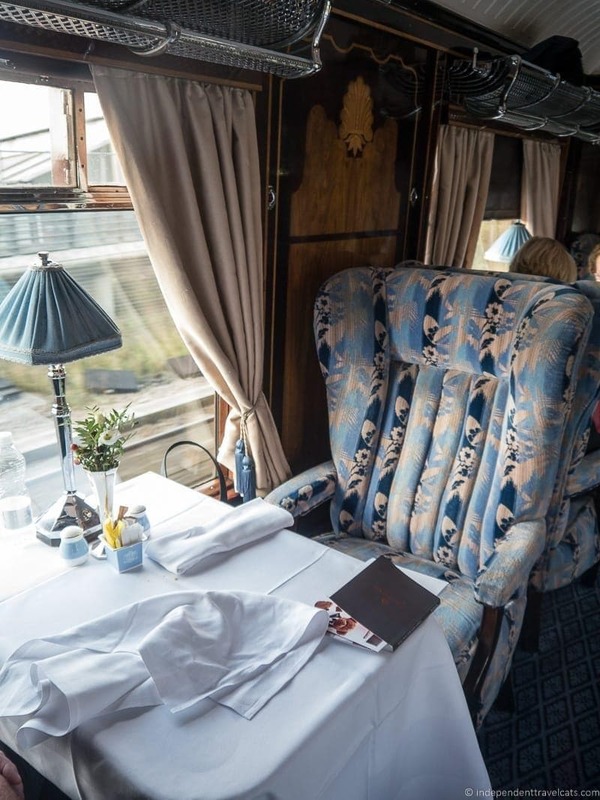 We’ll share all you need to know about the Belmond British Pullman train, including a bit about the history of the train and its carriages, seating arrangements for guests, and how to book a journey. We’ll also share loads of photos from our own trip aboard the British Pullman. Below we’ll tell you all you need to know about the British Pullman train, including a brief history, where it goes, how much it costs, and how you can book it yourself. The train carriages for the Belmond British Pullman were purchased by American businessman James B. Sherwood who had a dream of reviving a luxury train service similar to the historic Orient Express in its heyday. During the late 1970’s and 1980’s Sherwood purchased a large collection of historic train cars, including sleepers, Pullman cars, and dining cars. Many of the train cars purchased by James Sherwood are used for the Venice Simplon-Orient-Express but the Pullmans are specifically used for UK routes with a base in London’s Victoria Station. The purchased train carriages were in various states of disrepair and have all been meticulously cleaned, refurbished, and refitted. Formerly operated by Orient-Express Hotels Ltd., the company changed its name to Belmond in 2014. If you want to learn more about James Sherwood, his dream, and his journey to relaunch the Orient-Express, I recommend reading his book Orient Express: A Personal Journey. 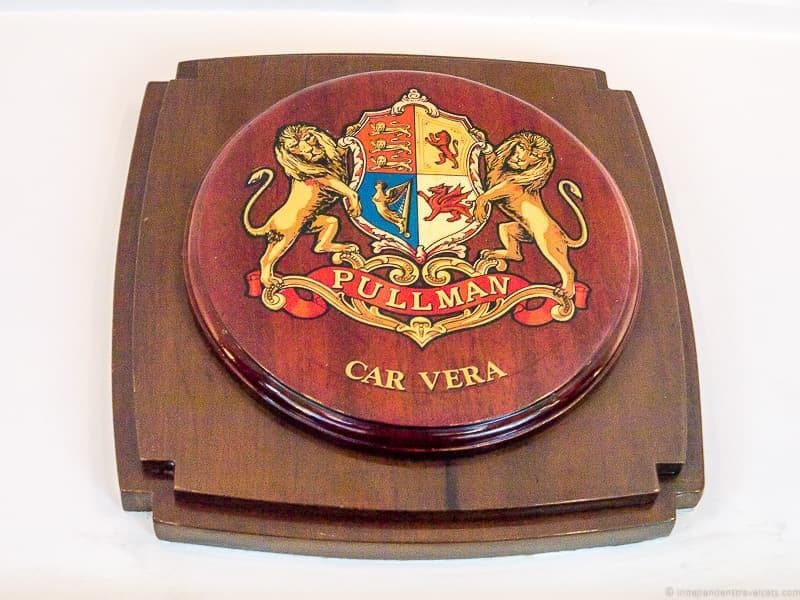 The name Pullman comes from the American George Mortimer Pullman who designed train cars that were comfortable and luxurious, often referred to as “palaces on wheels”. The concept of luxury train cars appealed to the British and soon the British Pullman Car Company was born. Each of the British Pullman’s train carriages has its own unique history and between them, they have served in some of the most famous historic train services in Europe. These include the original Simplon-Orient-Express, Brighton Belle, the Golden Arrow, and the Queen of Scots Pullman. Many of the train carriages have also served as royal carriages in transporting members of the British royal family and for other memorable events, such as state visits and the funeral of Winston Churchill. Where does the British Pullman train go? The British Pullman makes a variety of short trips across the UK, primarily in England, usually starting and ending in London Victoria station. On some train journeys, passengers stay aboard and enjoy a meal on the train and watch the scenery go by whereas others head to a destination. The train regularly goes to destinations such as Bath, Canterbury, Cornwall, Kent, Devon, York, and Bristol. It also makes trips to special destinations such as Blenheim Palace and Chatsworth House. 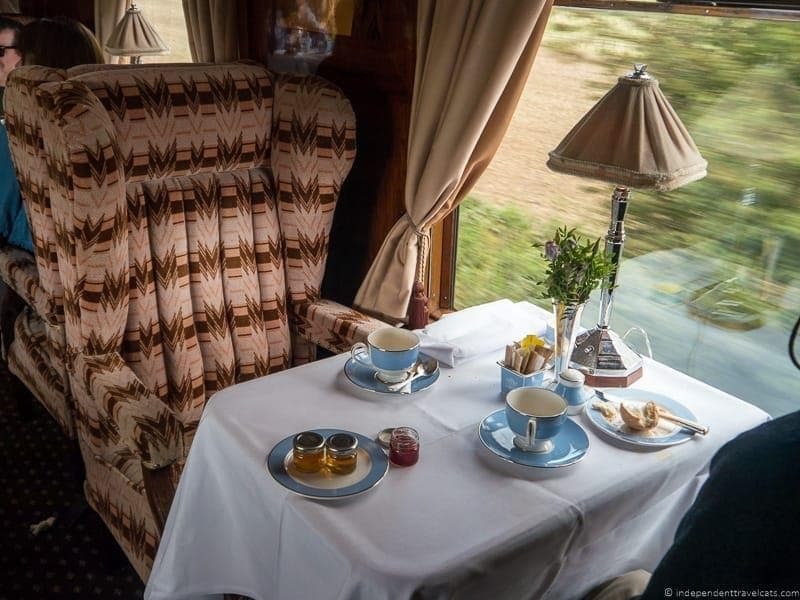 The train also regularly offers holiday lunches, teas, and special events (e.g., Mother’s Day afternoon tea day trip), murder mystery lunches, and steam-hauled journeys. Private celebrations for groups can also be arranged. Most trips are day trips but the train does sometimes make overnight trips (called “Short Breaks”) where guests stay in a select hotel at the destination for a night or two. The train also serves as the first or final leg for those going on a Venice-Simplon-Orient Express train journey that begins or ends in London. Is the British Pullman part of the Venice-Simplon-Orient Express? Yes and no. 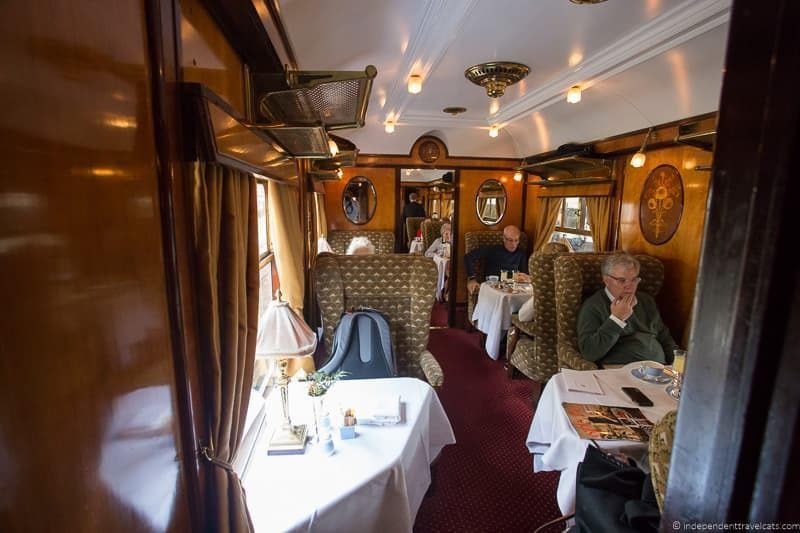 As noted, the Belmond British Pullman is used for the UK portion of the travel for anyone booking a Venice-Simplon-Orient Express train journey that begins or ends in London. However, many of the Venice-Simplon-Orient Express journeys do not include London and only use the continental train. The train that is referred to as the Venice-Simplon-Orient Express is the continental train, not the British Pullman. 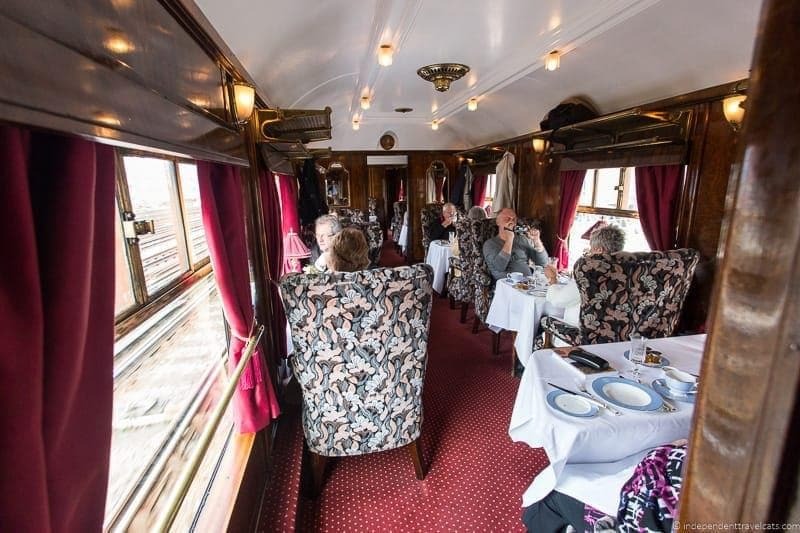 In the UK, Pullman cars are used whereas on the Venice Simplon-Orient-Express continental train, historical sleeping cars and dining cars of the Compagnie Internationale des Wagons-Lits are used. Now in historical terms, the British Pullman is neither the original Orient Express train (in fact there was never a specific train called the Orient Express – it was just the name of the route) nor is its route part of the original Orient-Express route which ran from Paris to Istanbul. The Venice Simplon-Orient-Express operated by Belmond uses the name based on the historical Simplon-Orient-Express train route that ran from Paris to Istanbul via the Simplon Tunnel. But neither train was actually the “original Orient Express” although a few of the train cars were used in the original Orient-Express or Simplon-Orient-Express routes, including the sleeper car we slept on during our journey to Venice. The Venice Simplon-Orient-Express does make an occasional Paris to Istanbul journey (typically once a year). So, after that confusing answer, the answer is not really! 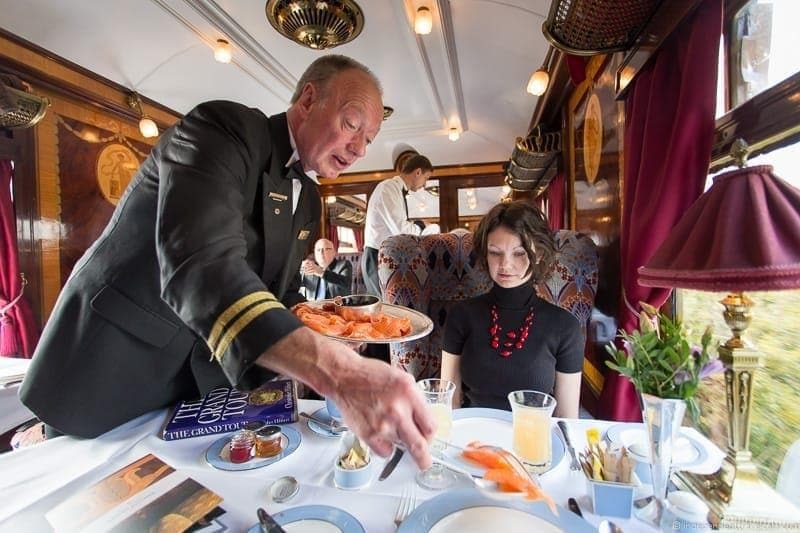 Most day journeys on the British Pullman range between £250 to £520 per person, depending on services included on the journey (e.g., some come with just brunch whereas others might include brunch, a city walking tour, and a 4-course dinner on board). The overnight journeys and short breaks cost more. If you are interested in something even longer, you can read our full review of the Venice Simplon-Orient-Express train review. Seating arrangements on the British Pullman? Most tables are arranged as open plan seating with 1, 2, 3, and 4 seat tables along the sides of the train carriage. The majority of the tables are set with 2 seats. However, at the end of many of the train carriages are 4-person coupés which are set apart from the other seats and have sides to them, making them semi-private. Note that normally a party of 2 would be seated at a 2 person table but sometimes couples may be assigned to share with a table with another party of two. Parties larger than 4 will be split across more than one table. Which is the best train car on the British Pullman? They are all different and which is best entirely depends on your taste. People tend to choose their favorite based on the color schemes (these change from time to time), decorations (e.g., marquetry details), or history. People also tend to take a fancy to the carriage in which they are assigned as each has its own appeal. We’ll share photos and info below on each of the carriages which may help you choose your favorite and you can always request a specific carriage for your journey (although requests are not guaranteed and not all the cars are used for many of the journeys). Note that the British generally refer to train cars as “train carriages” or sometimes “train coaches” but all three terms just mean a passenger train car. You can look up future train journeys and making bookings online through the official Belmond website. You can also call Belmond to make reservations or ask questions at 0845 077 2222 or email them at reservations.uk@belmond.com. 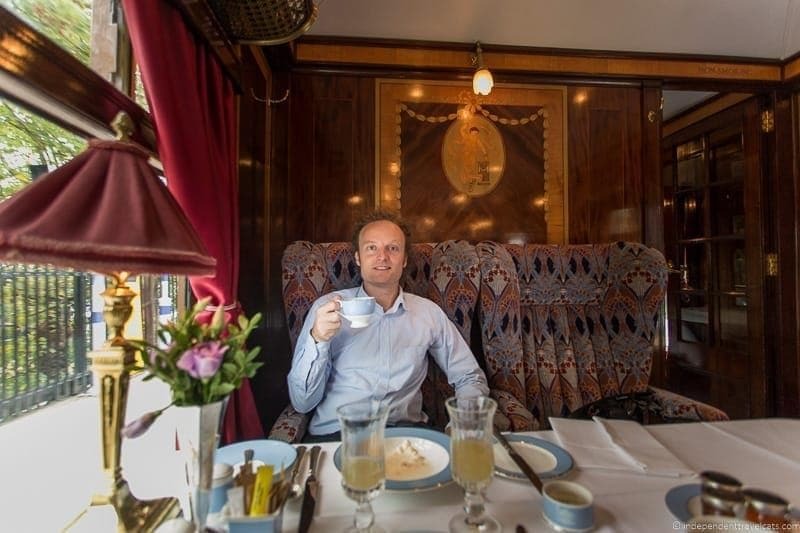 As a passenger with a booked ticket on the Belmond British Pullman, you get to check in and wait at a special separate lounge at Victoria Station in London. You’ll receive your carriage assignment upon check-in (or a confirmation of an assignment) so you know which carriage to board once the travel arrives. 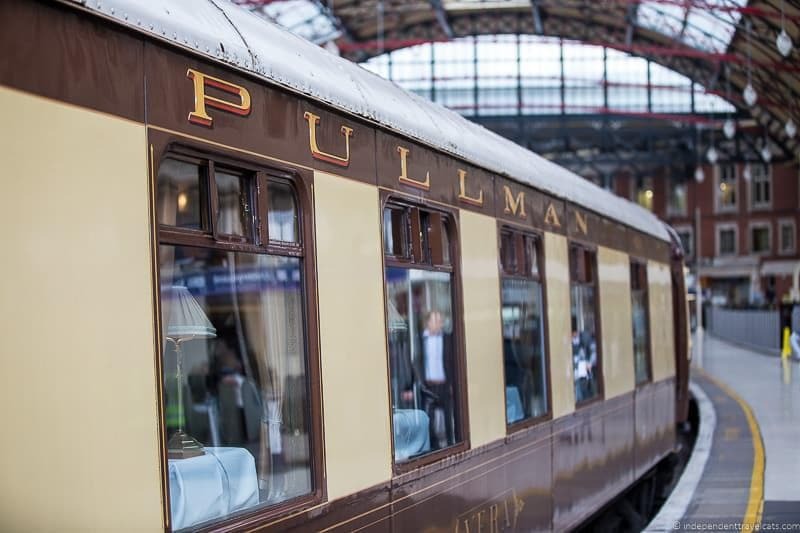 The historic carriages of the British Pullman are all a gleaming uniform umber and cream color and each carriage has its name painted on the exterior. You can find details near the steps about where each carriage was built. They are a thing of beauty in our eyes! Once the train is ready to board, a staff member stands at the entrance to each carriage to welcome and help passengers aboard. 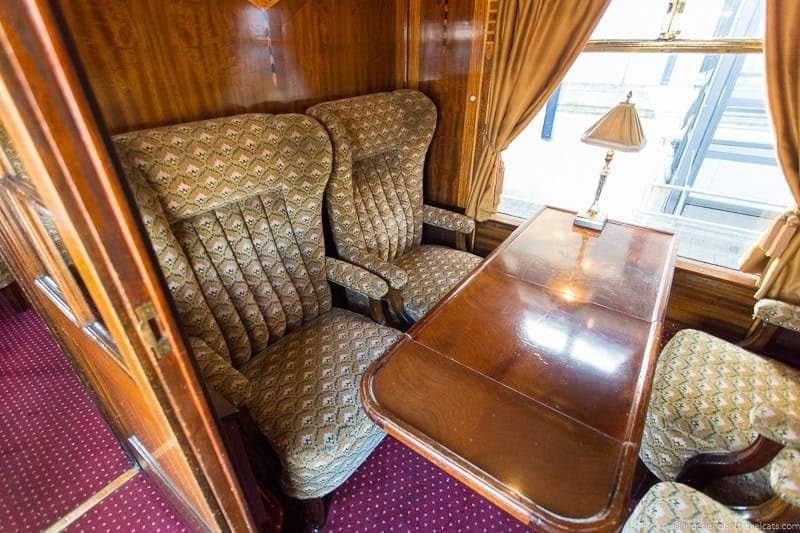 All trains have things in common, but the beauty of the British Pullman carriages is in their details. When you are aboard, keep an eye out for these little details that make these train cars so special. Some of these details are restored original details and some are complete replacements or new details as many of the cars as noted were either in terrible states of repair when acquired or were not originally used as dining cars (some were sleeper, parlor, lounge, or kitchen cars at one time). 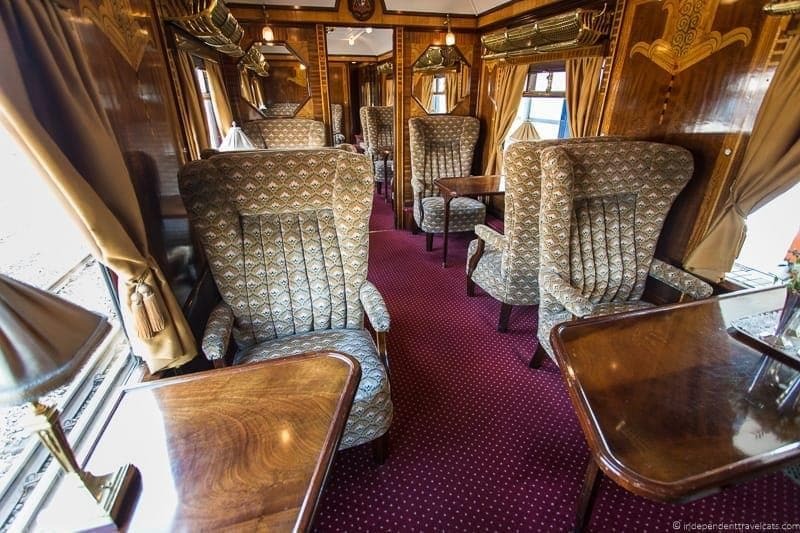 Details to look out for are the beautiful art deco marquetry, brass lamps, luggage racks, and fittings, bevelled glass, velvet upholstery, and beautiful woodwork. Each train carriage also has its own design and style so look out for the differences (e.g., color schemes, upholstery patterns, fittings, marquetry). Perhaps one of the most surprising (and hidden) details can be found in the bathrooms. 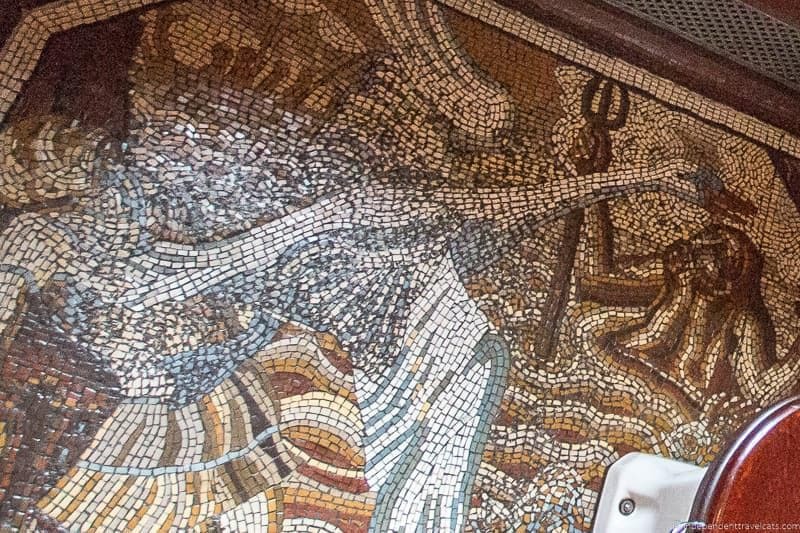 Each train carriage generally has one lavatory located on each end and each has a mosaic floor (I believe most, if not all, were created by late British mosaic artist Marjorie Knowles). Also note that each carriage has an informational plaque at one end denoting its history as well as wooden signs denoting its name so you know which carriage is which. 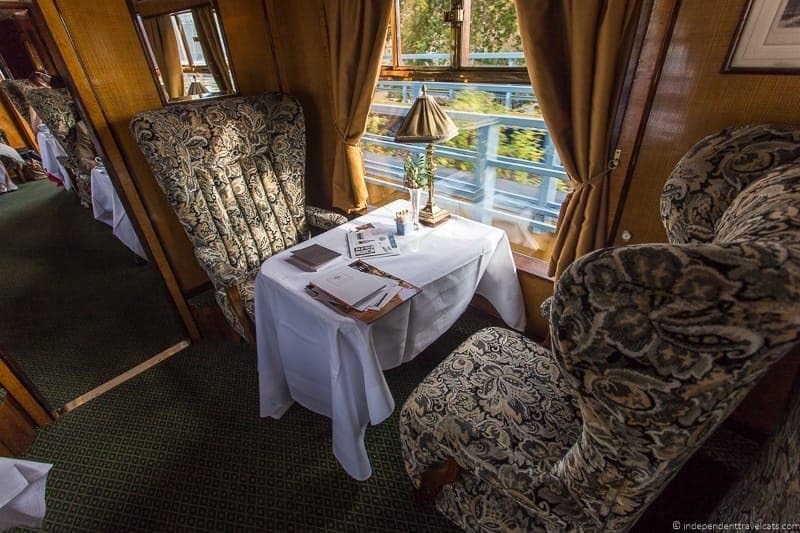 The Belmond British Pullman is currently composed of 12 historic train carriages that have been skillfully restored and refitted to be able to meet modern-day mechanical regulations. The carriages date from 1925 to 1951, most being built in the 1920’s and 1930’s. 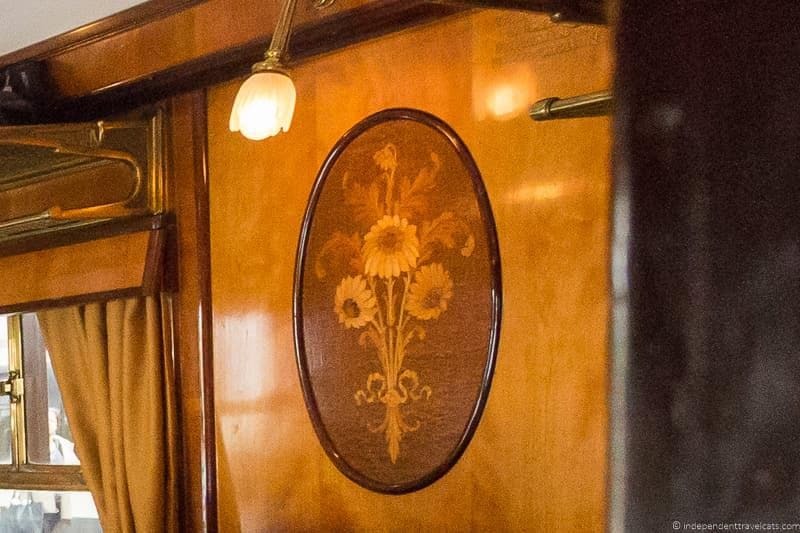 Each train carriage has its own history and distinctive woodwork or furnishings that make it unique. 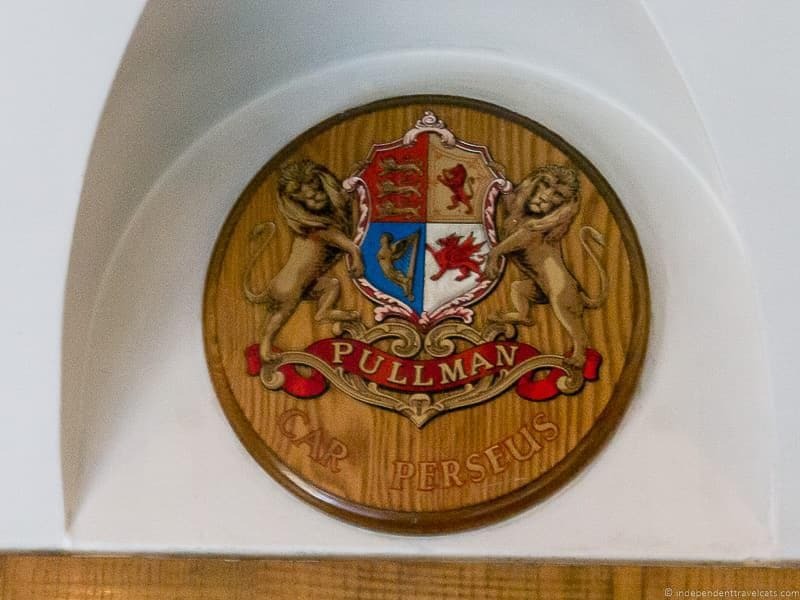 Some of the photos below don’t fully capture the beauty of some of these carriages, but hopefully it will give you a good taste of what it would be like to take a ride aboard the British Pullman. 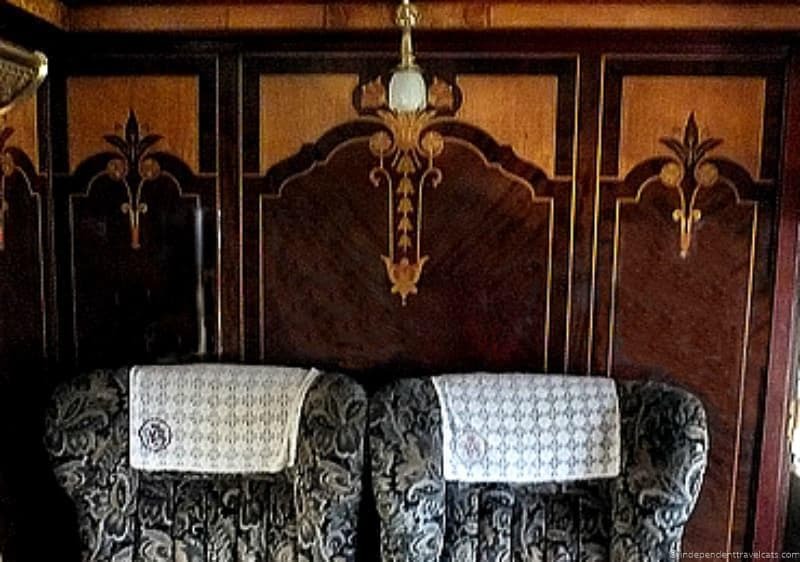 Just know that the chair upholsteries, curtains, and carpets are replaced in the carriages from time to time so the color schemes have and will likely continue to change in some of the train carriages. For instance, while Gwen may currently have blue seats and blue carpeting, a few years from now it may have green seats. The best way to tell the train cars apart (well aside from the signs of course!) is the marquetry and fitting details as some of the carriages do have similar (or the same) carpets and upholsteries. 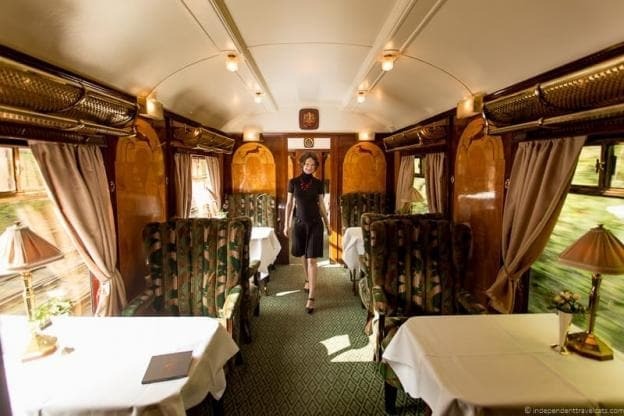 Audrey began its life as a first class kitchen car, entering service in 1932 as part of the Southern Belle (later renamed the Brighton Belle) which was the world’s first all-electric Pullman train. Audrey was used regularly by members of the royal family including Queen Elizabeth II, The Queen Mother, and The Duke of Edinburgh. In 1940, it was damaged by a wartime air raid bombing while at London Victoria Station. Audrey would continue making the trip between London’s Victoria station and Brighton until 1972 when the Brighton Belle was taken out of service. 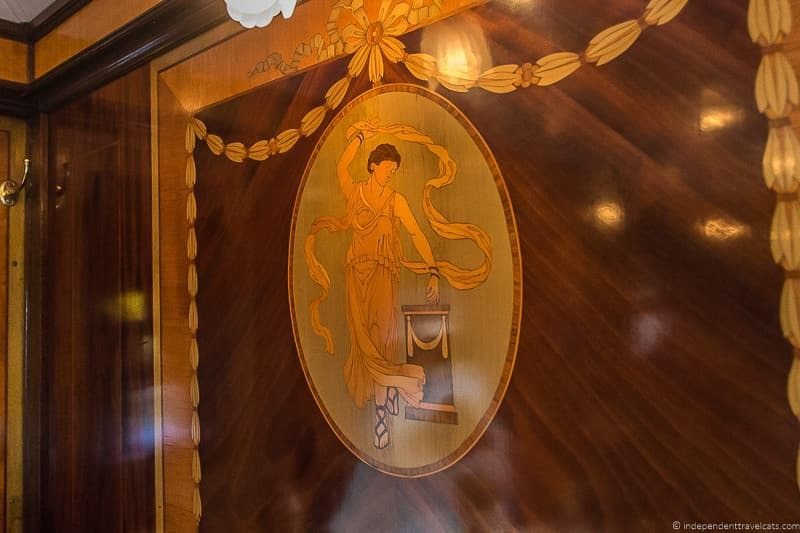 The most interesting feature of Audrey is definitely the 12 beautiful marquetry panels of landscape scenes as well as its Art Deco strip lighting. Cygnus is one of the younger carriages, not being completed until 1951 because of delays caused by World War II. Cygnus was a first class parlour car and entered service with the Golden Arrow, carrying passengers between London and Dover. It was a popular car and was used by royalty and heads of states on official visits. It served on the Golden Arrow until its final journey in 1972. It made its film debut in 1976 in the film Agatha. Two interesting features of Cygnus are its mirrors and beautiful swan mosaics on the bathroom floors. Note: It used to be said that this was one of the train carriages used as part of Winston Churchill’s funeral train in 1965; however, this does not appear to be so based on video clips of the funeral train and that information I believe has been corrected. Perseus, however, was definitely a part of Churchill’s funeral train. Gwen was built in 1932 and was one of the train carriages on the Brighton Belle. The carriage had a sumptuous interior and became very popular after it was used to convey Queen Elizabeth (later the Queen Mother) to Brighton in 1948. After the Brighton Belle was taken out of service in 1972, Gwen was used as a restaurant in Essex and later as a public attraction. Gwen is a beautiful carriage with a signature pearwood shell motif on walnut. This was probably my second favorite train carriage as I love the colors in this carriage. 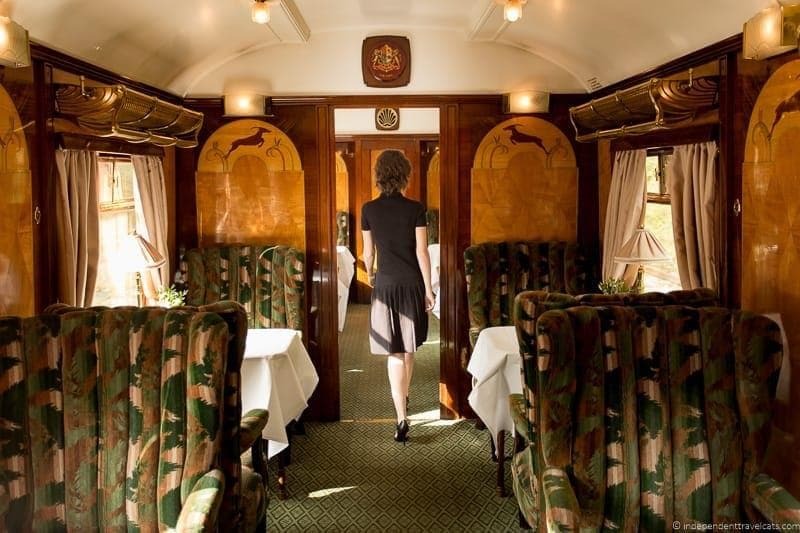 Ibis was built in 1925, making it the oldest carriage that is currently part of the Belmond British Pullman. It operated for several years in continental Europe, including the Milan to Venice section of the Simplon-Orient-Express, the Deauville Express, and the Pullman Express. Ibis was then moved back to England and served on the Golden Arrow from 1930 to 1952 and then as part of a special Cunard boat train from 1952 to 1963 where it transferred ocean liner passengers to and from Southampton. It was retired from service in 1968. This was the train that Laurence and I were assigned to and we loved it. It has a great history and beautiful marquetry and medallions depicting Greek dancers and musicians. Built in 1928, Ione was originally a first class kitchen car and served on a great many services over its life. It started off running on services on the Great Western Railway and then the Bournemouth Belle. Later it served on the Queen of Scots, the Yorkshire Pullman, the Teens-Tyne Pullman, and the South Wales Pullman. From 1964 until its retirement in 1968, Ione operated on the Talisman service which ran from London to Edinburgh each day. 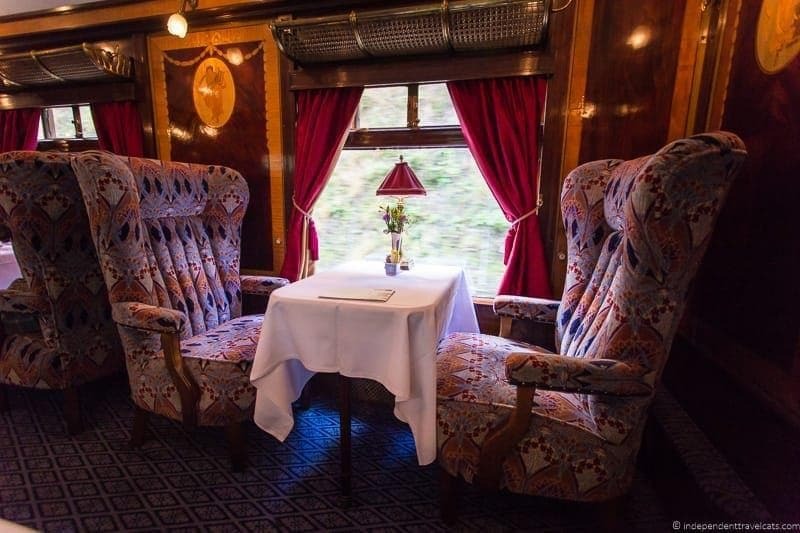 The Ione carriage, during our trip, was decorated very much like the Ibis carriage during our train journey with the same chairs and general colors schemes for the upholstery, lamps, and curtains. A significant distinguishing feature of this elegant carriage is its frieze of Victorian pink roses. 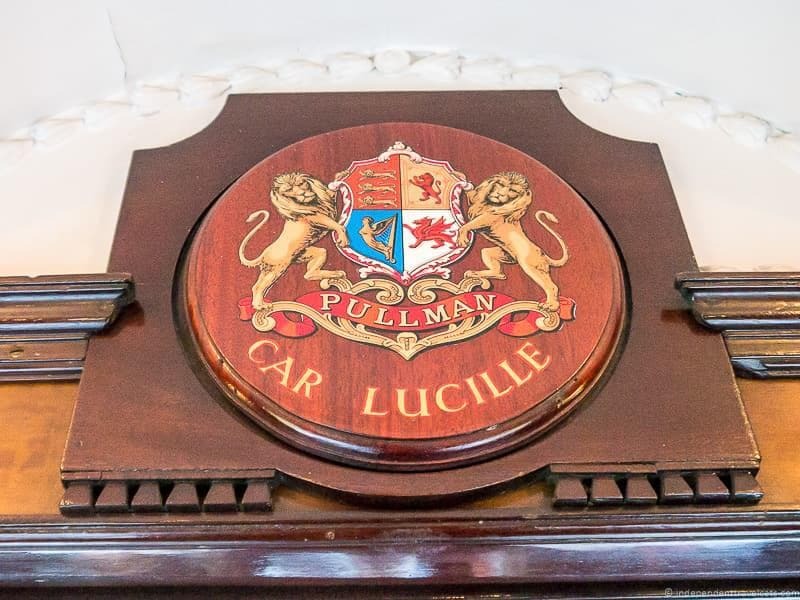 Built in 1928, Lucille is an all-steel car intended for service on the Queen of Scots, but because of the war served in a number of services, including the Ocean Liner Expresses, Torquay Pullman, Queen of Scots, and Yorkshire Pullman. It was part of the Bournemouth Belle from 1964 to 1967. In 1967, Lucille was purchased by train enthusiast Mr. Esmond Lewis-Evans for preservation in the short-lived Ashford Steam Centre and Mr. Lewis-Evans himself lived in the carriage for about 16 years! Lucille has some beautiful marquetry of Grecian urns on dyed green holly wood. Minerva was built in 1927, and this Pullman car would serve many train routes including the Devon Belle Pullman. 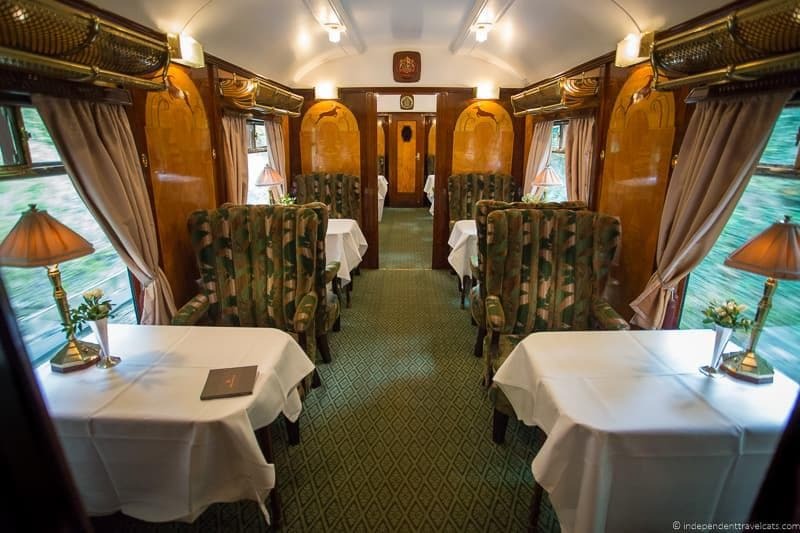 During World War II, it was put into storage and then in 1951 was refurbished to join the Golden Arrow as a first class parlour car. In 1953, the car was used to carry visitors from Dover Marina to London for the coronation of Queen Elizabeth II and for the Coronation Derby. It was withdrawn from service in 1961 and was preserved in the Lytham Creek Railway Museum. 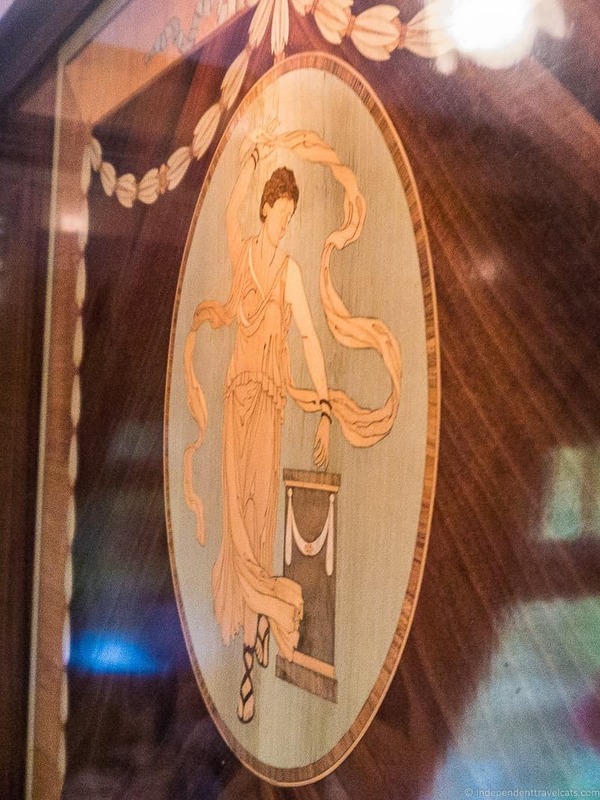 Minerva’s distinctive feature is its delicate Edwardian marquetry. Like Cygnus, Perseus was designed in the 1930’s but was not completed until 1951 because of the war. It joined the Golden Arrow and would be part of the Golden Arrow until 1972, taking part in the last journey of the train. In 1956 Perseus was used to carry the Russian leaders Bulganin and Khrushchev during a state visit and in 1965 was part of Sir Winston Churchill’s funeral train. In 1976, it was preserved in the North Yorkshire Moors Railway and also starred in the film Agatha. The distinctive features in Perseus are its ash panels and old framed prints on the walls. Phoenix was built in 1927 as a first class parlour car and was originally named Rainbow. However, in 1936 while in Michedlever, England it caught on fire and all but the underframe was destroyed. The car was rebuilt and fittingly named Phoenix and then joined the Golden Arrow service in 1952. Phoenix was a popular royal carriage and is said to have been the favorite carriage of Queen Elizabeth, the Queen Mother. It was also used to carry visiting foreign dignitaries such as General de Gaulle in 1960. It made the last journey of the Golden Arrow in 1972. 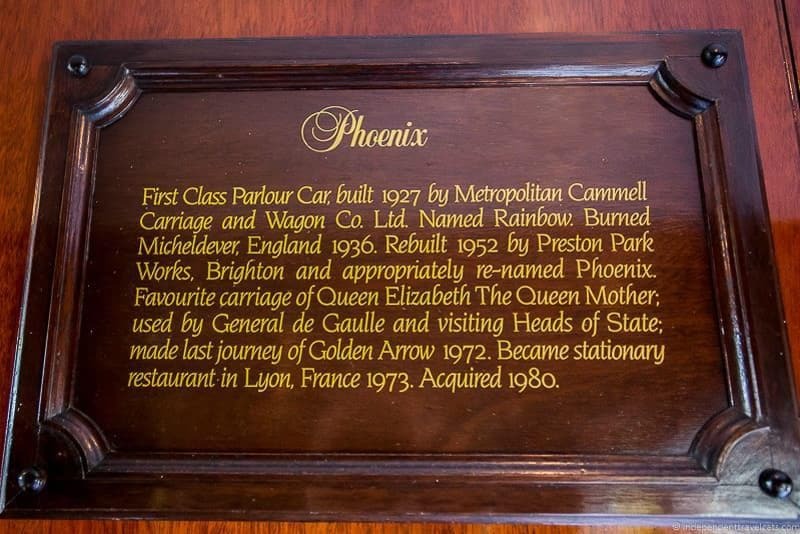 Phoenix was then sold to Hotels-Restaurant Mercure in 1973 and used as a stationary restaurant in France. Interesting features of Phoenix are its beautiful flower bouquet marquetry details and oval mirrors. Vera was built in 1932 as a first class kitchen car for the Brighton Belle as part of an all-electric Pullman train. It is built like Audrey and the two are always paired together. Vera was also hit during the air raid at Victoria Station in 1940, but it suffered a direct hit and the roof had to be extensively repaired. It rejoined Brighton Belle in 1947 and continued to run with Audrey. The carriage was often used by members of the British royal family, such as to review the Fleet in 1953 and for Prince Charles’ and Princess Anne’s first trip on an electric train in 1954. It ran until Brighton Belle service was withdrawn in 1972. It was then purchased by Mrs Deborah Turner and used as a garden house in Suffolk. The most distinctive features of this elegant carriage are the sandalwood panels depicting a gazelle leaping between two palm trees. Zena was built in 1928 as a first class parlour car. It served on the Great Western Railway on ocean liner services to Plymouth and in the Torbay Pullman. Later it would serve on the Bournemouth Belle until the war. After the war, the carriage would be part of the Queen of Scots, the Yorkshire Pullman, the Tees-Tyne Pullman, and the South Wales Pullman. It would carry a number of notable people including the French President Vincent Auriol and his wife during their state visit in 1950. Zena retired in 1965 as part of the final run of the Tees-Tyne Pullman. In 1966, the car was consigned to the scrapheap, but was luckily saved by Terry Robinson of Doncaster who purchased it and later sold it to Venice Simplon-Orient-Express Ltd in 1979. The distinctive features of Zena are its beautiful marquetry and its octagonal mirrors. 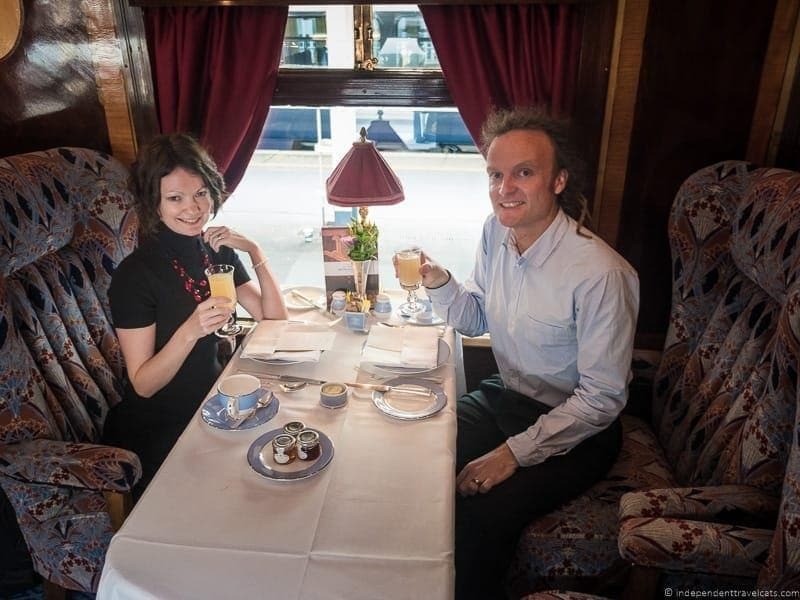 There you have it, our tour of the Belmond British Pullman train! 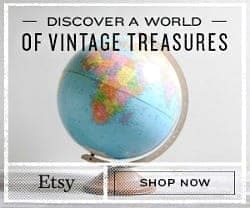 If you are looking for even more detailed information about the histories of the historic train cars of the Belmond British Pullman and the Venice Simplon-Orient-Express, you might want to read the book by Shirley Sherwood titled Venice Simplon Orient-Express: The World’s Most Celebrated Train. Hope you enjoyed the post, whether you are an armchair traveler wanting a sneak peek inside this famous train or someone thinking of booking a journey on the British Pullman. We had a fantastic trip (you can read more about our actual experience here) and definitely recommend it as it a way to celebrate a special day or event. 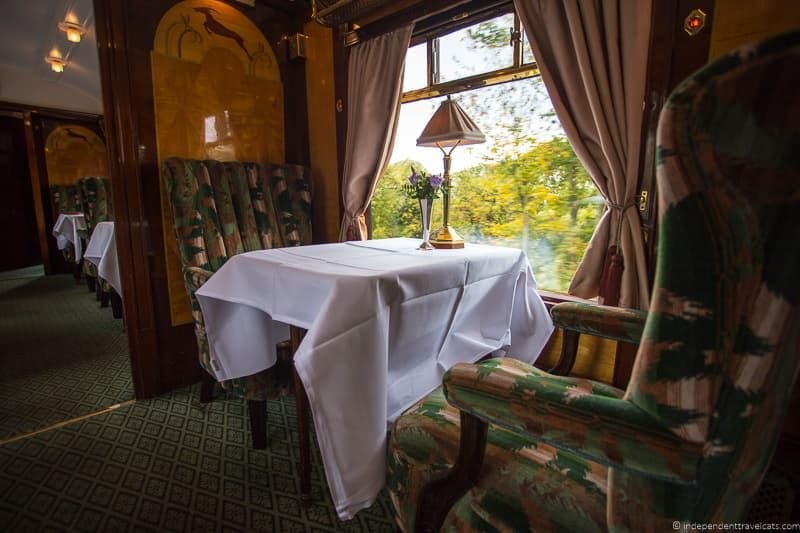 Do you think you would enjoy a ride on the Belmond British Pullman train? Which train carriage do you think would be your favorite? 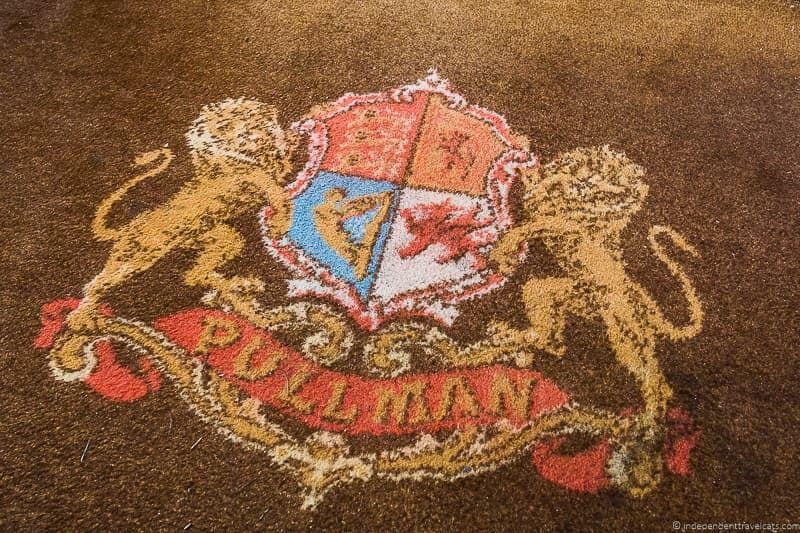 If you’ve been on the British Pullman, we’d love to hear about your own experience. We hope this information is helpful to anyone planning a trip on the British Pullman or Venice Simplon-Orient-Express. Feel free to leave us any questions you have about the train below and we are happy to try to answer them! Thank you so much for your insights into this magical journey! You have to reveal the source or brand of your luggage please! Most attractive! Great article with perfect pictures to compliment your “travel swag.” Your fashion taste is on point! LOVE!! 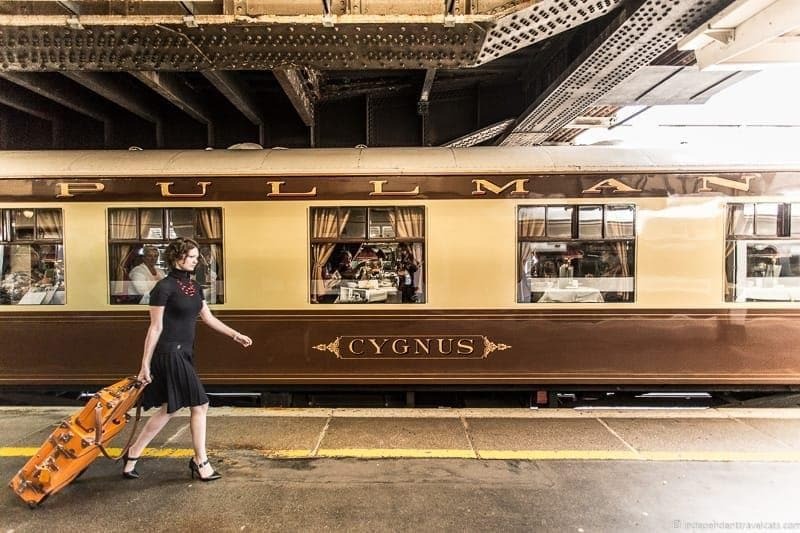 We are in love with this post, as we are with everything that recalls the “Golden Age of Travel.” A Pullman journey has long been on our Bucket List, and your photos show exactly why. So elegant, so posh. 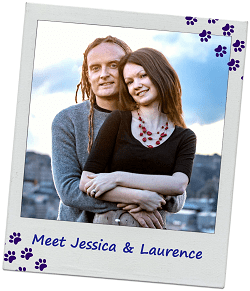 (Side note: Jessica, we love your luggage!) 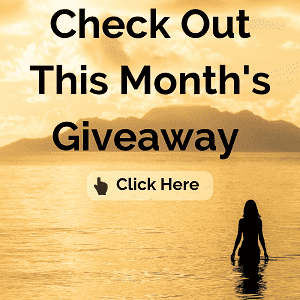 We are definitely tucking this one away for later – we have a big “milestone” year coming up…this trip is a good contender for that celebration! 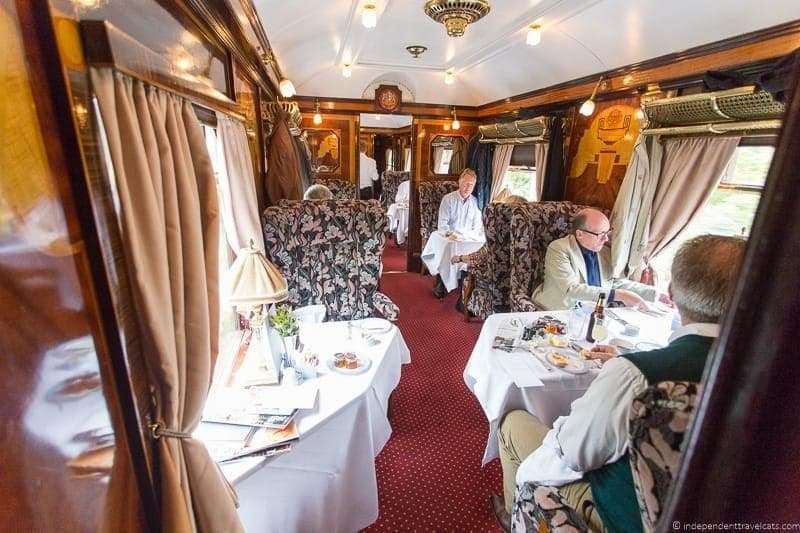 The Belmond British Pullman Train is wonderful. All the image was gorgeous. Your black dress also and your old luxury luggage is cool. You look like a big celebrity. At first, I see the luxury train under service and design. Really a good experience for me. Thanks for sharing your great experience. 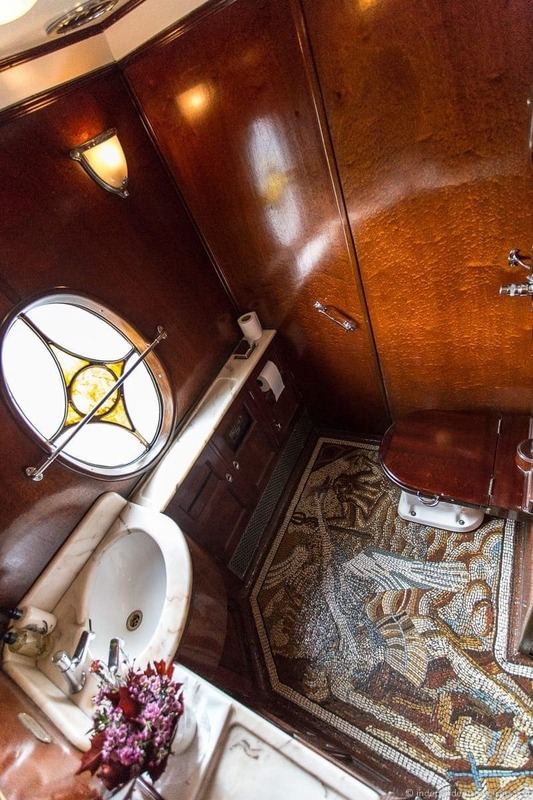 These train journeys look very luxurious. The restored cars are beautiful and a reminder of a bygone era. I love the floor mosaics. How luxurious! If you ever travel to Chicago, you should check out the Pullman neighborhood, which is a national monument. I wrote a post about it on my blog – it’s cool that those cars are still being used! Thank you so much for sharing! 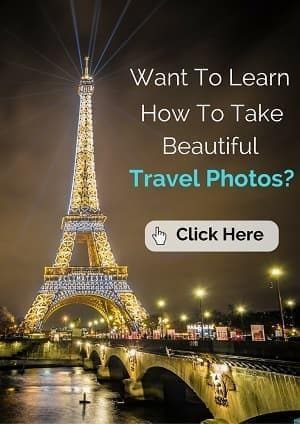 The photos are wonderful and truly inspire me to take a trip when we visit London! We were able to take the Belmond Hiram Bingham through Peru and loved the luxury and step back into time. Wow this really looks absolutely amazing. The only downside is the price, but it is the ultimate in train luxury. I think I am going to have to do this on a special occassion so I don’t have to feel guilty splurging. How awesome! We looked into the Venice-Simplon Orient Express once, but I like the sound of doing the UK portion of the route on the Belmond! I’d love to be transported back in time on such a train and wish traveling via by train was still this way! Pinned for later! Such an interesting post and so many gorgeous pictures! I found out a lot about the Belmond British Pullman Train from it. I didn’t know for instance that the Orient Express was not a train, but a route. I always thought it was a train, like the Glacier Express, in Switzerland. 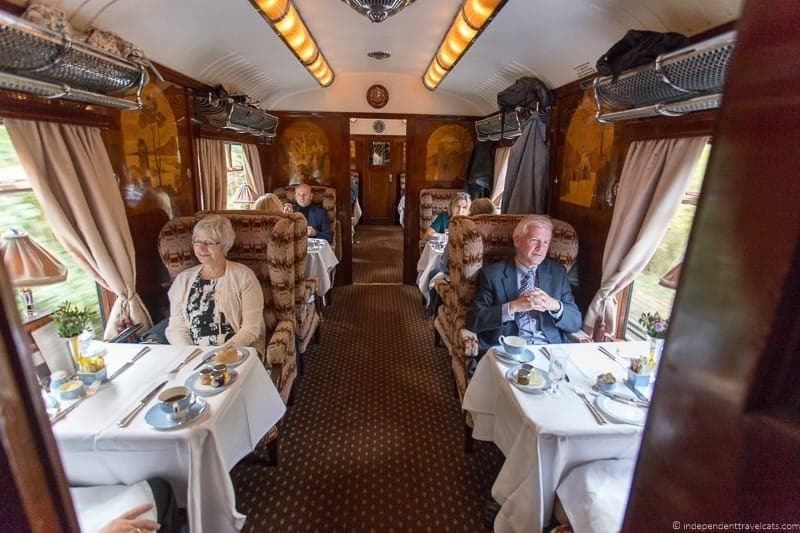 I would definitely enjoy a ride in the Belmond British Pulman. It seems you had a blast on this ride too.